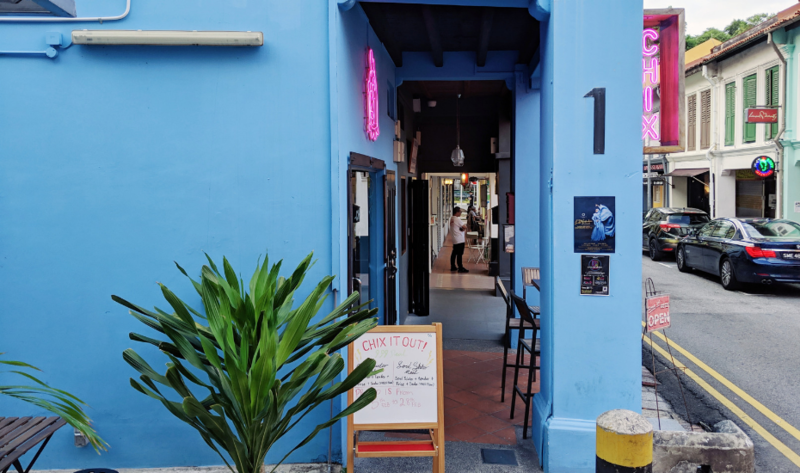 Whether you’re a born and bred local, longtime expat or an in-the-know tourist, you’ve probably heard of the Kampong Glam district. 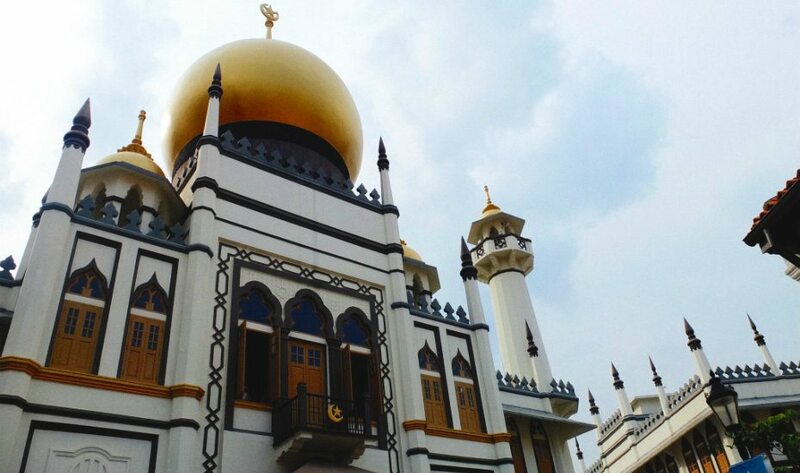 Once an ethnic enclave for the Muslim community, including Arab and Bugis traders, the area is a hip neighbourhood peppered with hole-in-the-wall boutiques in Haji Lane, quaint restaurants and bars in Arab Street, and charming cultural spots. Here’s a little tour of this buzzy treasure trove — from Bussorah Street to Sultan Gate — that’s spilling with surprises at every corner. 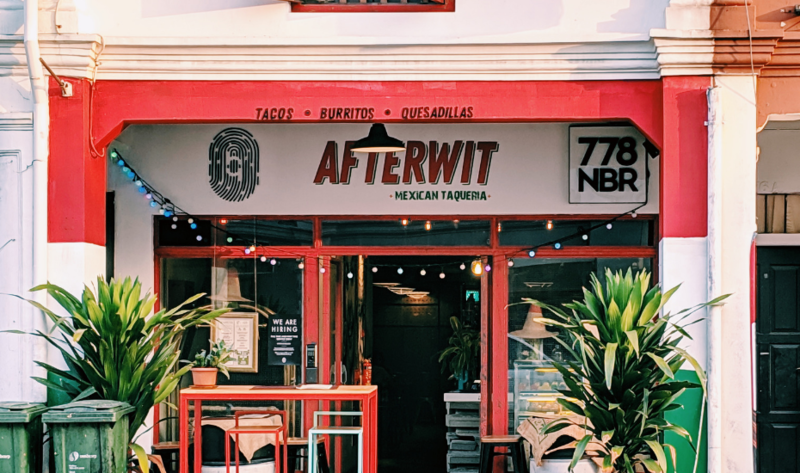 This colourful and rustic cafe is in a niche of its own, serving up halal Mexican fare and sporting an indie vibe. Don’t pass up the tacos, we say – these little pockets store a zesty and meaty punch like no other. Wash it all down with a refreshing mocktail like the lime, lychee and mint pina colada. For over 15 years, Sofra has been dishing out authentic Middle-Eastern fare at its restaurant on Beach Road. What sets this joint apart from many others in Singapore’s Arab quarter is their all-Turkish kitchen staff. Pop by for a quick bite and try the signature Sofra kebab, which adds walnut, eggplant and cheese into the mix for a little extra texture. Need a Swedish meatball fix? 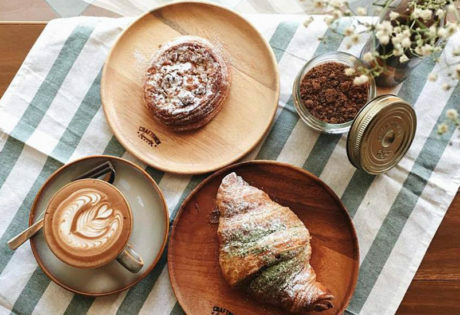 Give Ikea a pass, and head over to the end of Arab Street for Fika. Here, you’ll find a small but serviceable menu of Swedish classics like Toast Skagen, Pytt i Panna, and Tunnbrödsrulle. 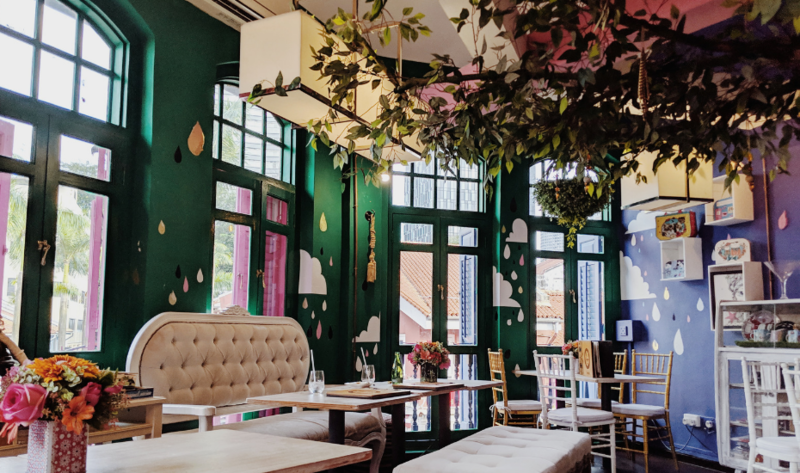 With its whitewashed walls and light-filled interiors, the homey café is a breath of fresh air amidst the many Mediterranean eateries within the area. Don’t leave before trying the much-raved about lingonberry cheesecake! How could you resist taking a picture of this gorgeous place? La Marelle is one of the cutest, most whimsical cafes you can find in the area. We’d gladly sit around for an entire day if we didn’t have more exploring to do. Menu picks include lots of halal Western fare like baked rice and pastas that are as satiating as the decadent desserts. Local star Taufik Batisah and fellow fried chicken fanatic Ismail Bober joined forces to create Chix Hot Chicken and bring a halal version of Nashville fried chicken to the masses. With three levels of spiciness (plus a non-spicy option), a hot chicken sandwich and a creamy vanilla milkshake, you know where to go to indulge in one of fast food’s best inventions – in our opinion, at least. With its massive maroon banner, it’s hard to miss this street-side outdoor eatery. 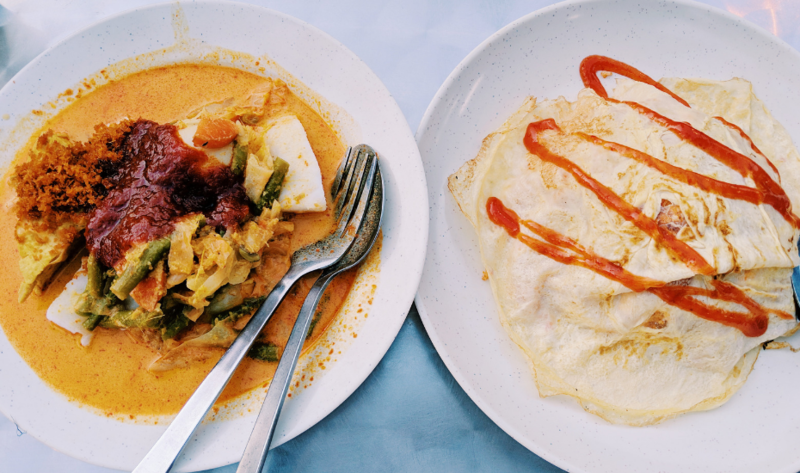 Known for its low-priced authentic Malay food such as nasi goreng, mee rebus, lontong, roti kirai and laksa, patrons gather here for a break away from the surrounding pricey restos — and a good cup of hot teh tarik! 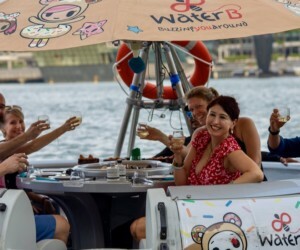 This cafe/bar concept will get you sorted out for potent cuppas in the arvo and killer cocktails when the sun sets. Pop by in the day, and tuck into hearty portions of eggs Benedict, Croque madame, and if you’re in the mood for a sweet brunch treat, you can’t go wrong with the decadent French toast with sea salt caramel. 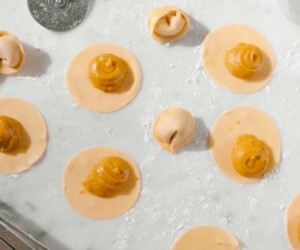 We’re all about fusion food, but get this: Flying Monkey offers contemporary Indian along with tapas and cocktails. Yes, cocktails! 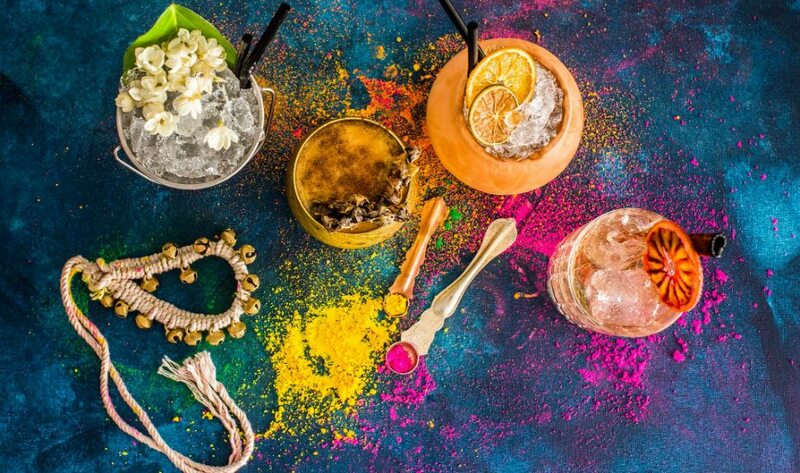 There really aren’t many serious Indian restaurants in Singapore with focused bar programs, and that’s where Flying Monkey fits in — seriously good Indian food, and Indian-influenced refreshingly spicy cocktails that aren’t merely an afterthought. Dreaming of a Europe trip but can’t quite squeeze out the time (or money)? 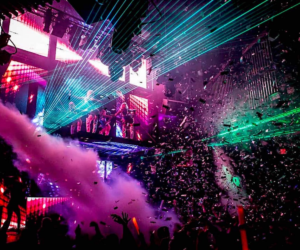 An afternoon spent at I am… might be what you need. 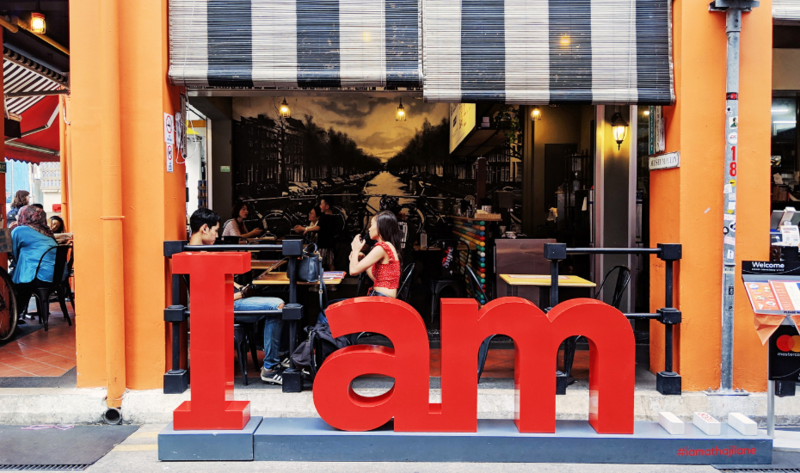 With an Amsterdam-inspired sign and signs that take you to the streets of Europe, this themed cafe serves up signature burgers to go with a side of people-watching. These include the charcoal-grilled beef burger and ‘The Boss’, stacked with crispy turkey bacon. Looking every part like an authentic izakaya, this halal eatery is tastefully adorned with Japanese art and even has a tatami-seating area on one of the floors. On the menu are classic kushiyaki like assorted grilled meats and vegetables on a skewer, signature charcoal-grilled dishes like saba fish flavoured with shio and salt, udon bowls and more. And if you want to drop by for after-work drinks with your Muslim colleagues, this place serves up mocktails instead. Safe to say you guys won’t show up to work the next day with a hangover. 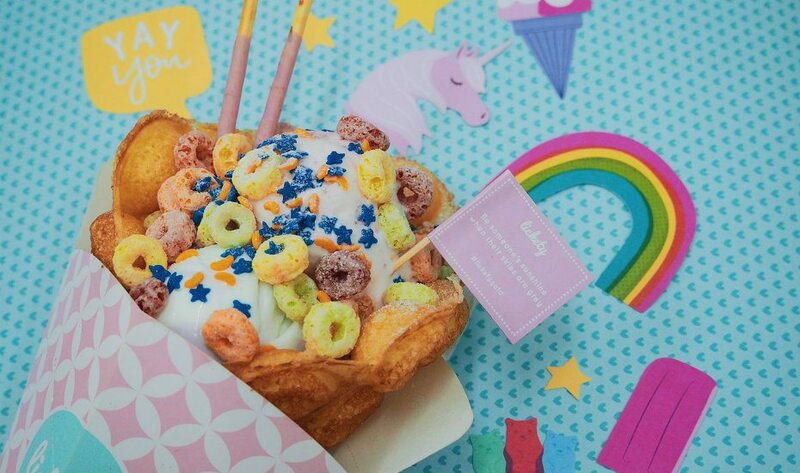 Instagrammable in itself, this pastel wonderland is a hot favourite for a cool down with its ice cream in an egglet waffle, and topped with all the sweet treats your heart desires: they’ve got everything from sprinkles and cookies to sauces and cereal. What can we say about this Italian restaurant? Its menu of authentic Italian favourites is highly raved about — so much so that it’s ranked the number one Italian restaurant in Singapore on Tripadvisor! Tuck into plates of signatures such as fettucini with fresh whole lobsters, eggplant parmigiana and mushroom risotto. Don’t expect any wine-pairing, the resto’s halal-certified! The glorious scent of baked dough and freshly brewed coffee will have you busting through its doors. 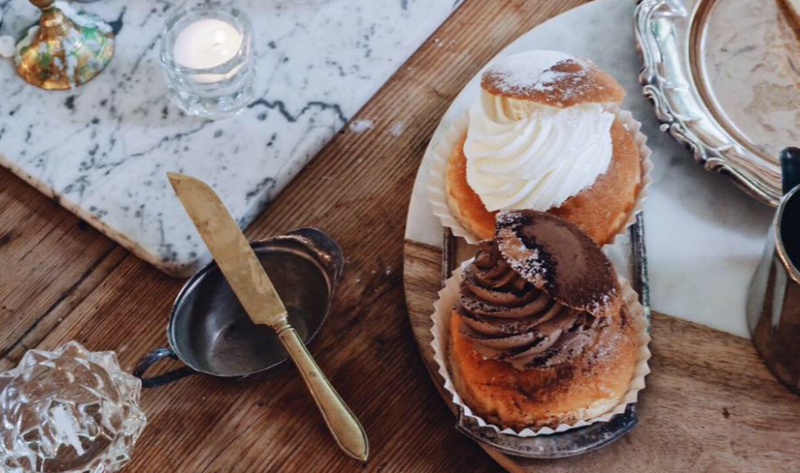 Brought to you by the team behind Fika Swedish Cafe & Bistro, Konditori serves up artisan bakes alongside comforting cuppas. Take your pick from croissants (there’s even a red velvet version) and crusty loaves, to cinnamon buns and delectable tarts. 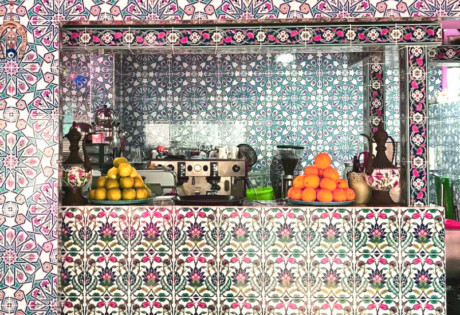 The colourful décor of Alaturka features azure tiles, Turkish lamps and raw brick walls that will have you walking into its restaurant. Order up all your favourite Turkish standards here, but make sure you don’t miss out on its signature kebabs. If you’re with a group, order the kebab sharing platter with a side of bread and assemble your own! Now, this is an establishment that promises to treat diners like Sultans. 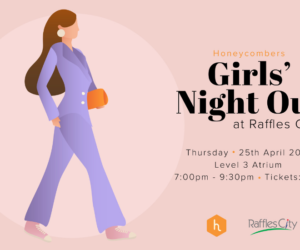 Here, you’ll feast on authentic Malaysian delicacies like beef in sweet black sauce, spicy grilled chicken in Bedahara style, jackfruit in coconut gravy and the aromatic lemongrass honeyed chicken. The restaurant also prides itself on Malay hospitality, so expect stellar service all around. Dining in a group? Beirut grill offers a selection of kebab platters that serve up to four of your buddies. Try out the mixed kebab platter that includes lamb chops, lamb kebab kofta, tikka kebabs and a serving of Arabic rice. If you’re after something a little different, go for the grilled seafood kebab platter (kebabs aren’t always beef, lamb or chicken). And to top it off, end your meal with a platter of fluffy, rich baklava. 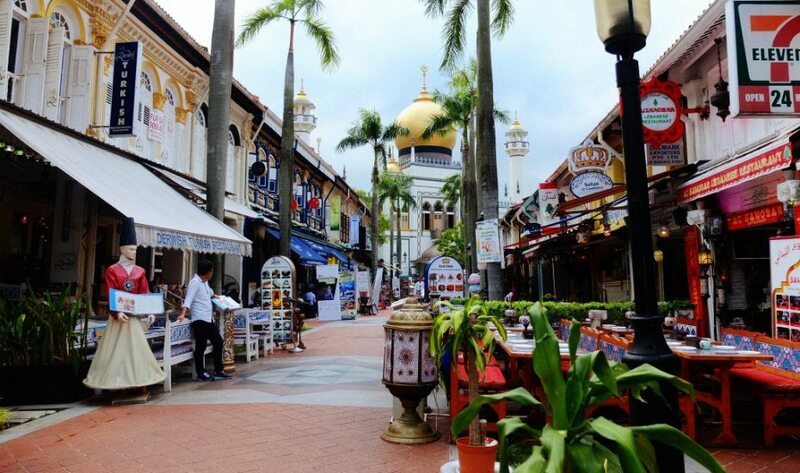 This is a street market with a lawn and a view of the Sultan Mosque’s golden domes. 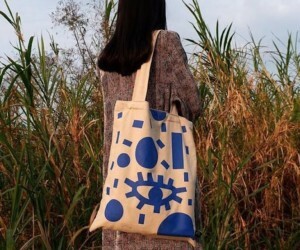 Expect drinks, snacks, kitschy trinkets, performances and more at this marketplace that brings back the kampung vibes. Check out the Facebook page for updates – it seems this market is happening every month and we’re all for it. Along the restored shophouses down the pedestrian bit of Bussorah Street lies the Malay Art Gallery. The store brims with Malay and Indonesian daggers (aka keris) in all shapes and sizes, as well as an interesting collection authentic Malay souvenirs, batik, talismans and heirlooms. 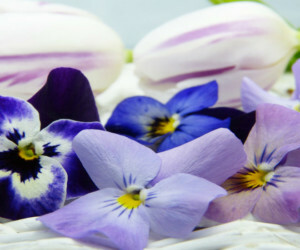 Don’t be surprised when the exotic scents of Jamal Kazura Aromatics lead you to its Bussorah Street boutique. Prominent in the Kampong Glam scene since 1933, the store is popular for its natural oils which have medicinal or healing properties. It’s also known for the making and selling of attar oils, as well as carrying, Egyptian perfume vials, fragrances from the Middle-East, India and Europe, and massage oils. This little gallery store has stolen our hearts with its curation of meaningful pieces and a space that’s designed to help you slow down. After a busy day, popping into this gallery is the perfect way to catch our breath and admire the handiwork and art pieces that are part of the store’s collection. Our favourite? 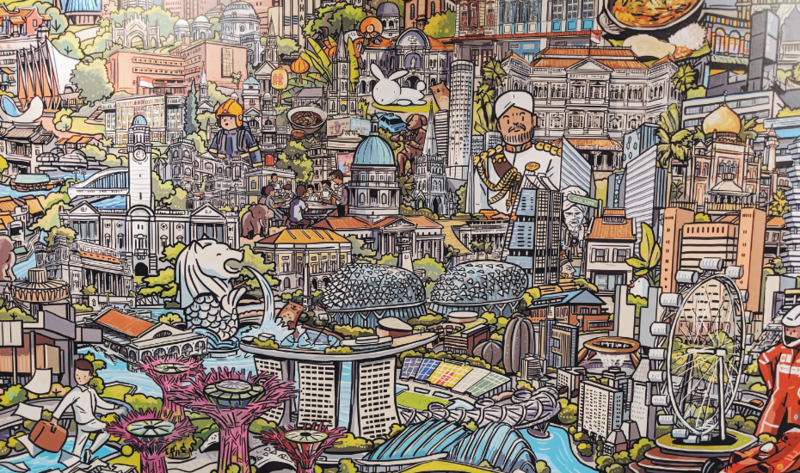 The wall-long mural with colourful depictions of local scenes. The former palace of Sultan Hussein Shah is now known as The Malay Heritage Centre. 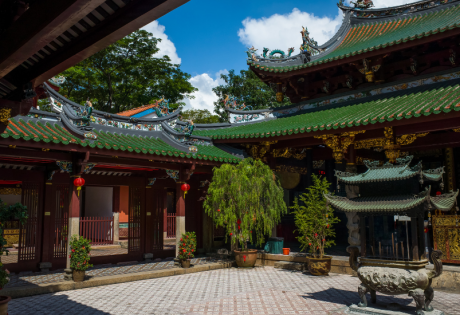 With specially curated exhibitions, tours and workshops surrounding the Malay culture in Singapore and the thriving port Kampong Glam was once known for, it’s definitely a must-visit when you’re in the area. Here’s where you’ll find fascinating street art and graffiti by both local and international artists. Explore graffiti shop The Black Book for all your spray painting needs, as well as its practice walls for new sprays and tags. After a quick browse and a shop, chill out on at the little garden situated on the opposite side of the road. 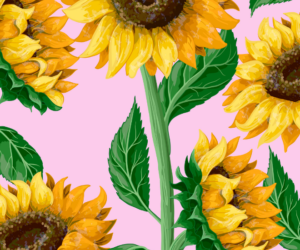 Get well acquainted with Singapore’s arts scene at Aliwal Arts Centre. Besides holding the Urban Arts Festival, it also houses burger joint Kaw Kaw SG and kid-friendly cafe Eat Play Love. 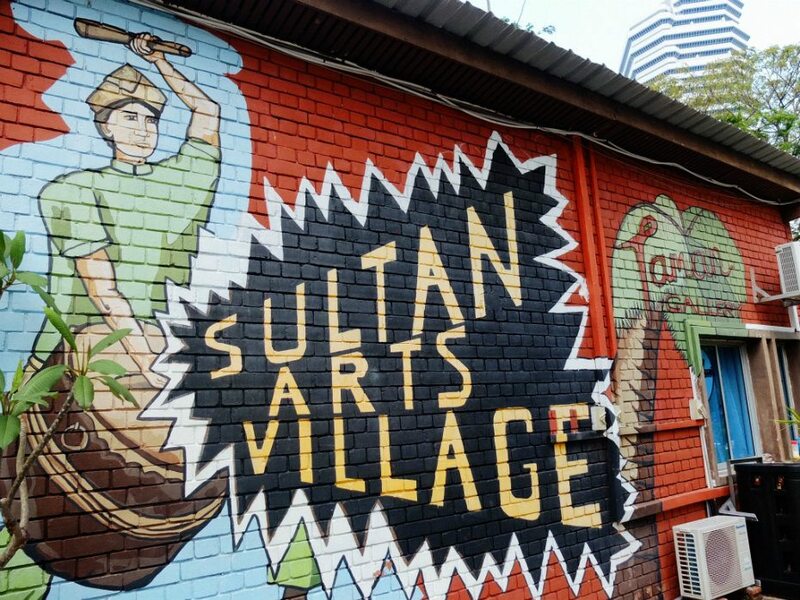 We also recommend checking out the wall behind the Aliwal Arts Centre every now and then to find jaw-dropping wall art that’s ever-changing! Built in 1824 by the first sultan of Singapore, Sultan Hussein Shah, this magnificent mosque is the biggest in Singapore. The grand architecture of the mosque can easily be spotted as you talk a stroll down Bussorah Street. Learn more about the mosque and its surrounding area through the visual boards and art around it.